It’s a shame there’s not a Yo Sushi at Waterloo because that’s my regular train station and I’m a fan. If I’m going through Paddington I often perch on one of their stools and help myself to something exciting from the conveyor belt – and at airports too. If you’re interested, it’s not too difficult to find out that Yo Sushi have a policy on the sustainable sourcing of their fish. They don’t sell bluefin tuna, which is one of the most endangered species on the planet but they admit that this is partly due to its stratospheric price tag. There’s plenty of yellow fin tuna though. Apparently most of it comes from the Maldives and Sri Lanka, where the fishing methods are more sustainable than in other parts of the world. Yo Sushi’s fish suppliers all follow recommendations from the Marine Stewardship Council/// about which fish is sustainable and which should be avoided. Their nutritional guidelines seem pretty good too. Raw fish and rice are healthy foods and not very fattening. If you want to check there’s a little table at the back of their menu booklet, telling you how much fat, sugar and salt is in their food. And I discovered that their policy on freshness and hygiene was rigorously enforced, as you’d expect. Staff have to change their plastic gloves, wash their hands and throw away food that’s been on the conveyor belt for too long. Every dish is given a time stamp. Once that expires food gets tipped into the rubbish containers. Some dishes are only given an hour, fish and rice generally get two and salads three hours. And that’s what made me wonder about how much food was wasted. A lot, it turns out. I asked the chap behind the counter what proportion of food he thought was chucked. He said it could be as much as a third. Yikes! 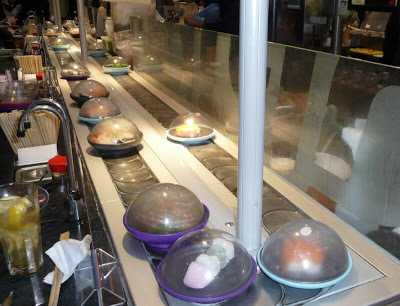 More is apparently thrown away at off-peak times because the conveyor belts must be kept stocked but less is eaten. I’d noticed before how much packaging there was. What I hadn’t noticed was that none of it was recycled – all the food and other rubbish was thrown into the same bin. It’s all very well sourcing your fish sustainably but if huge quantities of it end up in the bin that’s not sustainable at all. And I have to admit that I thought the staff training on eco-issues could be improved. I asked an employee, who’d been working at Yo Sushi for 15 years about the sustainable fish policy. He didn’t know what ‘sustainable’ meant and told me instead about how fresh the food was. Yo Sushi needs to go much further than just ticking the box about their fish suppliers. It should audit its systems to minimise waste, separate what it throws away and train staff on environmental issues that are relevant to the business. The carbon impact of wasting food is huge – even worse it it’s fish or meat, so fast-food chains should make this a priority issue. I might be an unusual customer in some respects but I suspect that I wouldn’t be the only one interested to hear what they’re doing on this front. I’d also like to know if they’ve looked at other issues like air freighting food and energy efficiency. I couldn’t find anything on their web-site, so I suspect not. My final verdict on Yo Sushi? Thumbs up for healthy food but thumbs down for a healthy planet. Originally written for the Food Ethics Council (www.foodethicscouncil.org) magazine by Julia Hailes who is a member. This entry was posted in BLOG, Food & drink, Hotels & Restaurants, News 2008 and tagged Fish, Meat. The first YO! Sushi opened 12 years ago so how could a chef work there for 15 years. Paddington has only been open for 8 years? The statement about 1/3 of the food thrown away is also untrue, 1% of the food prepared is thrown away. If you think YO! is bad – you should start looking at super markets and other restaurants as they throw huge amounts but you just can't see it happen. I also work at yo! sushi. Just to clarify the belt waste is supposed be between 10 and 15%. I see a lot of wasted food and I was chastised for trying to minimise the wastage by taking it home or eating it on shift. I managed to make my point to the management and now they frown upon it considerably less than the other Yo! 's (the official policy is no waste is to be consumed by anyone (which is of course a horrifically wanton). I totally agree with 'Anonymous" when it comes to management. Half our kitchen is comprised of eastern european ex-cons. The management do expect completely unreasonable things and will attempt to get away with paying you short wherever possible. The word reciprocity is a word that this company doesn't understand. On the plus side….